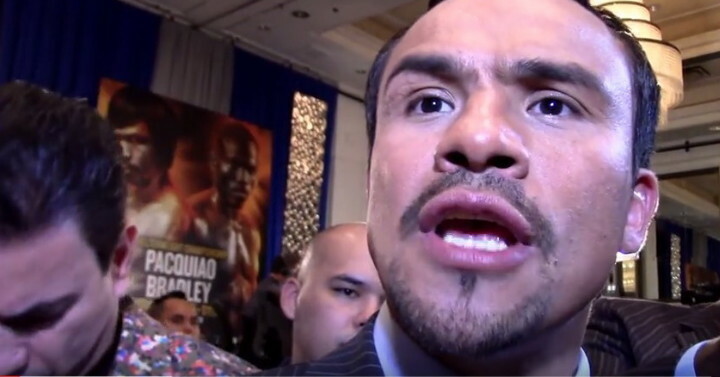 By Chris Williams: Former 4 division world champion Juan Manuel Marquez has decided to retire at 43 due to injuries. Marquez (56-7-1, 40 KOs) had been planning on returning to the ring on August 19 in Mexico, but he decided to retire instead. Marquez reportedly suffered an injury in training camp. It’s unknown what type of injury it is. Marquez has had knee problems dating back to his fight against Mike Alvarado in 2014. But at Marquez’s age, it could be a different injury. Marquez will be turning 44 this month on August 23, and that’s a ripe age for an athlete to be competing in a sport like boxing. Marquez hasn’t seen action since his win over Mike Alvarado on May 17, 2014. In the past, Marquez had talked of retiring following his 6th round knockout win over Manny Pacquiao on December 8, 2012. In hindsight, Marquez probably should have called it quits after that fight, because his career wasn’t the same afterwards. Marquez stayed out of the ring for 11 months after the win over Pacquiao, and went straight into a fight against Tim Bradley in his next fight on October 12, 2013. Marquez lost that fight by a 12 round split decision. Not surprisingly, the ring rusty Marquez did not fight well against. Staying out of the ring for a year and then not taking a tune-up fight, it was big mistake for Marquez. It was the wrong approach to fighting someone like Bradley. Marquez likely thought he didn’t need to take a tune-up after a year out of the ring. Marquez’s retirement comes just one day after the news of former heavyweight champion Wladimir Klitschko’s sudden announcement that he’s retiring. That was a shocker for the boxing fans, as they had thought that the 41-year-old Klitschko would take a rematch against IBF/WBA heavyweight champion Anthony Joshua. Wladimir was still fighting at a high level. Marquez’s situation is a lot different. He’d been out of action for so long. It’s not all surprising that Marquez is hanging up his gloves due to his long period of inactivity. It’s been over 3 years now. For Marquez to come back and fight a world class fighter like Miguel Cotto, it would be a bad idea. That’s one of the fighters that Marquez was interested in fighting. Cotto hasn’t fought in 2 years himself since his loss to Saul Canelo Alvarez, but he’s a little younger than Marquez at age 36. The high points of Marquez’s career were his wins over Pacquiao, Michael Katsidis, Juan Diaz [twice], Joel Casamayor, Marco Antonio Barrera, Rocky Juarez, Orlando Salido, Derrick Gainer, and Manuel Medina. The low points of Marquez’s career were his controversial losses and draw against Pacquiao and Chris John. Marquez fought well enough to beat Pacquiao all four times. Marquez’s very controversial 12 round unanimous decision loss to Chris John on March 4, 2006 in Indonesia is seen by many boxing fans as a terrible robbery. Marquez appeared to win that fight 11 rounds to 1 in this writer’s opinion. Choosing to fight John in his home country of Indonesia was a decision that Marquez likely would have second guessed if the fight were offered to him later in his career. Marquez was also beaten by Freddie Norwood, Floyd Mayweather Jr. and the aforementioned Tim Bradley. Marquez moved up 2 divisions from lightweight to welterweight to fight Floyd Mayweather Jr. on September 19, 2009. Marquez didn’t have the size or the hand speed to compete with Mayweather in that fight, and he ended up losing by a wide 12 round unanimous decision loss. Obviously, the payday Marquez received for the Mayweather fight made the risk well worth it in his mind. It remains to be seen if Marquez will stay retired. In boxing, retirements are often little more than vacations for fighters. It’s to imagine Marquez turning down a big money fight if he’s offered a 5th fight against Pacquiao. That might be hard to turn down if Top Rank, the promoters for Pacquiao, still want to match the two old timers after all these years. Pacquiao will be turning 39 in December, and he’s expected to fight WBO welterweight champion Jeff Horn in a rematch before the end of the year. If Pacquiao loses that fight, then retirement will likely be the direction he takes. Before Pacquiao does retire though, a final fight against Marquez would be a great option if the Mexican warrior can make it through a training camp without suffering another injury. Marquez has shown no interest in the past when a 5th fight against Pacquiao has been offered to him. He says he wants to remember his win over Pacquiao from 2012. Marquez already showed that he was better than Pacquiao in the three previous fights they had in the eyes of a lot of boxing fans. Nothing would change if Marquez fought Pacquiao a 5th time and possibly lost that fight. Marquez already showed the boxing public that he had Pacquiao’s numbers in the first 4 fights when he was in his prime. If Marquez were fighting today and still in his prime, he’d be making big money. Look at Saul Canelo Alvarez. He’s bringing in huge money for Golden Boy Promotions fighting over-matched opposition like Liam Smith, Julio Cesar Chavez Jr., Alfredo Angulo, Amir Khan and James Kirkland. Canelo doesn’t even have to fight good opponents for him to bring in good cash for Golden Boy. Marquez’s prime came at the wrong time. It’s too bad he’s not in his early 30s now, as he would be a huge money maker right now.